At High Desert Creations, I work with you to create distinctive styles of custom jewelry on commission. Your design vision is key to your satisfaction and I welcome collaboration! 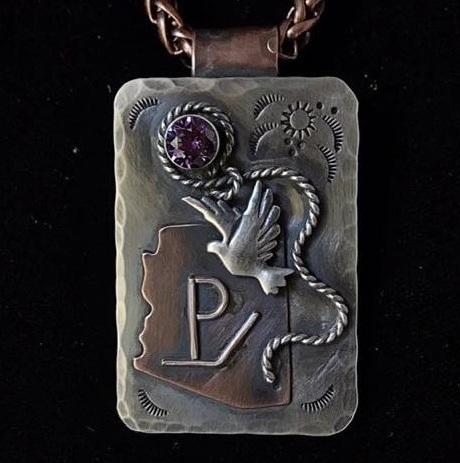 Via message, text, email, chat – or with a drawing or description or selection of stone, symbols and metals – I will work with you to create an original work of wearable art just for you. If you already have a piece that you would like me to rework – I’m happy to help with that. 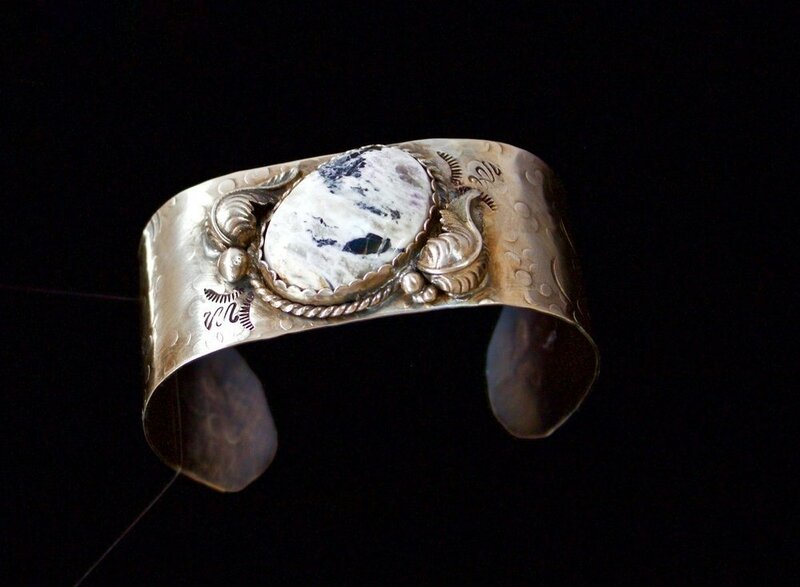 Special Occasion Commission for a husband to wife in Texas: I created this sterling silver cuff with a rare white buffalo stone as a birthday present. Ranch Brand with State Commission piece for: Diane Parker, Parker Brangus Ranch, San Simon, AZ. Storyteller Pendant Commission: The lariat in this storyteller pendant in sterling silver and 100% copper symbolizes the joining together of a couple from two different states; the crossed gavels represent their interest in auctioneering. Special Commission for Chris in Nevada: I was entrusted to transform these treasured cuff links worn by a loved father into earrings. 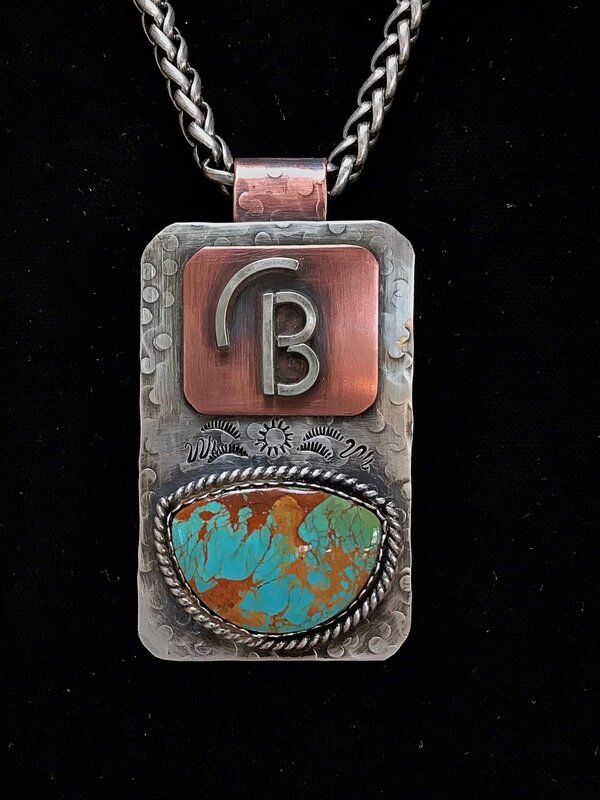 Special Commission for Candy in Arkansas: I loved designing and creating this pendant with a Mohave Turquoise stone set in sterling silver just for you! 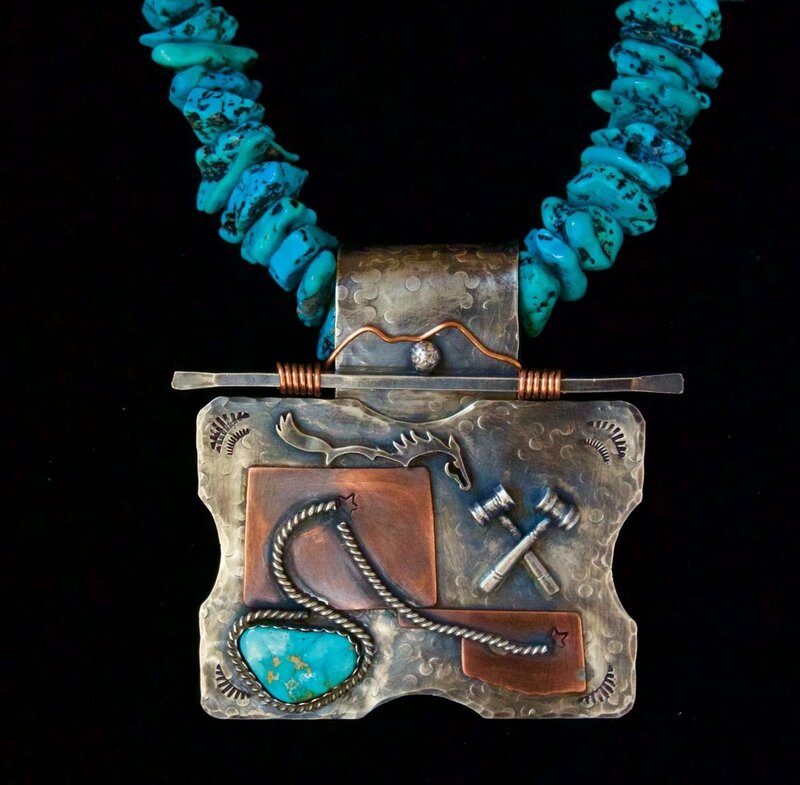 Special Commission for Jenny in New Mexico: Thank you Jenny for allowing me to create a piece with your hunting treasures. It’s a big responsibility, although I welcome it. Special Commission for Hutch & Nancy from Superior, Wisconsin: I was shown a photo of their ’32 Ford Roadster and fulfilled this unusual commission request by creating a replica of the car’s grill – appropriately set with a piece of Fordite stone. 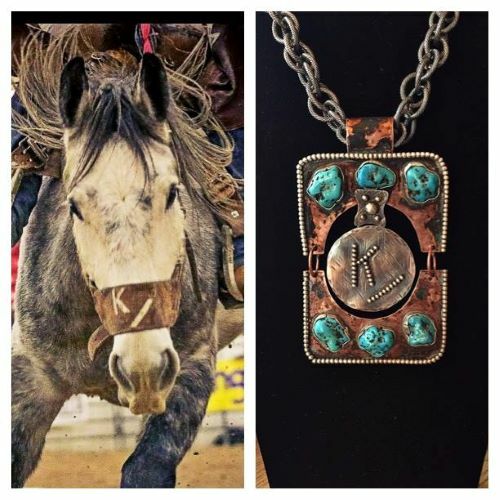 Ranch Brands: As a unique niche, I celebrate my affinity for fellow ranchers by creating custom ranch brand pendants and bracelets – for both women and men. Singular and distinctive, a custom piece of jewelry is most meaningful. I welcome collaboration and the chance to create a ranch brand pendant or bracelet that fulfills your design vision – an original work of wearable art for yourself or as a gift. As Tracy Spencer has commented: Rope and brands is what the west was made! Ranch Brand Commissions: Bracelets for the family! I love creating Brand pendants. They represent so much sacrifice and dedication. Need me to create one for you?? There are many styles to choose from, or design your own. Show that you honor & celebrate your home state with a custom pendant design with significant stones & symbols. Storyteller pendants feature hand-made inspirational symbols that represent several meaningful events in a person’s life. Storyteller Pendant Commission: “Messages From The Past” commissioned by a gentleman in California featuring a carnelian stone and copper & sterling silver symbols set on sterling silver. Storyteller Pendant Commission: I created this storyteller pendant for Vicki featuring a turquoise stone and symbols set in sterling silver that represent her own personal story. Storyteller Pendant Commission: A special & meaningful tale of California.